The wife of a police inspector has been gunned down in the city of Lagos by Customs Officers who fired random shots in the air. 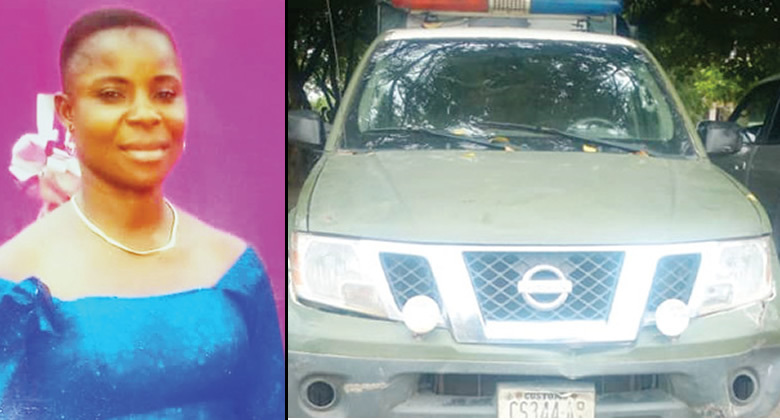 According to a PUNCH Metro report, the family of Patience Oni has been thrown into mourning after she was allegedly killed by officers of the Nigeria Customs Service in the Badagry area of Lagos State. It was gathered that the Customs officers attached to the Seme Border Command, reportedly led by one Abu Yusuf, were trying to evacuate bags of smuggled rice found around the F. O. Filing Station in the Badagry area of the state on Tuesday, November 20, 2018. PUNCH Metro reports that the officers allegedly shot in the air to scare people away and to prevent the residents from disturbing the evacuation of the bags of smuggled rice. It was gathered that Patience, who had gone to the market situated around the scene of the operation, was said to have been hit by a stray bullet allegedly fired by the officers. The deceased’s husband, John Oni, said Patience, while struggling for life, gave a good Samaritan her phone to call him, adding that she was dead before he could get to the Badagry General Hospital. The 45-year-old police inspector said, “A good Samaritan, who was at the scene of the incident, called to inform me that my wife had been shot. When I rushed to the scene, I was told that she was still alive and that the Customs officers had rushed her to the Badagry General Hospital. I am yet to recover from the shock of not meeting her alive when I got to the hospital. “I learnt that the Customs officers were chasing after some smugglers carrying rice before they opened fire on some boys, who reportedly struggled with them. I was told that my wife was at the bus stop close to a filling station around the Badagry roundabout where she was hit by a stray bullet from the Customs officers’ guns. The deceased’s son, Liberty, said his mother was a pillar to the family, adding that the trigger-happy officers, who allegedly killed her, must be prosecuted. The deceased’s elder sister, Ruth, 38, said Patience’s death was untimely, adding that the family wanted justice but did not know how to get it. PUNCH Metro reports that a bystander, Jimoh Aminu, 43, was also hit by the stray bullets allegedly fired by the customs officers during the operation but survived. The Lagos State Police Public Relations Officer, CSP Chike Oti, said a team of Customs officers, while on an operation in the Badagry area of the state, fired indiscriminately and allegedly killed a bystander. Oti said, “On Tuesday, November 20, 2018, around 1pm, a team of Nigeria Customs Service officers attached to the Seme Border Command, led by DSC Abu Yusuf, while on ‘Anti-Flying Operations’ at the Badagry roundabout by F.O. Filling Station along the Lagos/Badagry Expressway, allegedly fired indiscriminately in the area. The Public Relations Officer, Seme Border Command, NCS, Saidu Abdullahi, said the death of Patience was unfortunate, adding that the officers, who were conduting an operation to evacuate smuggled rice, fired shots in the air to scare those preventing them from carrying out the operation. Abdullahi said, “The command regrets the accident; we pray that the soul of the deceased rest in peace and hopes that the family is granted fortitude to bear the loss. Based on the incident report, the officers were carrying out their statutory duty. They found out that there were over 120 bags of rice in a warehouse around F. O. Filling Station. So, the officers went there to evacuate the rice and in the process of moving the evacuated items back to the station, they were waylaid by a mob. “In order to get out, they fired some shots in the air, which unfortunately resulted in the death of that woman. The officers were shooting in the air to scare the crowd so that they could move the items. The woman who died that day was just an unfortunate victim; we were later informed that the team took her to the hospital where she died.